More than 450 5Stars commented, Add an version control module this time!!! From now on, with the version control module, when there is an upgrade, this sweet app will remind you to update. Ultra Today Plus enables you to display all today plus information as Calendar, SMS, Messages without hovering on each icon. A very steady and mature app! It has been debugged after more than 10 thousands users’ testing. 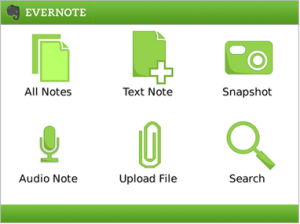 Evernote turns your BlackBerry® into an extension of your brain. Lister is a simple, easy to use application that allows you to create and manage multiple lists at once. When we set out to make Lister, our primary concern was usability, so weve done everything we can think of to keep the application streamlined and user friendly. Turn your HomeScreen into Today screen! Create your own customized Today screen! Searching for the best Hidden Today Theme? Why don’t you create your own? With deToday you can bring your appointments right on the HomeScreen, no need to hover over the Calendar icon. You can choose the number of appointments to show, you can pick the right color and font size, that suits you best. You can even choose your own background. 5. TXTLater by SKAN DbyDx Software Pvt. Ltd.
TXTLater schedules SMS, Email and Calls to be sent /invoked later at a future date directly from your BlackBerry®! TXTLater allows you to schedule Email and SMS messages and Phone CALLS to be sent/scheduled at chosen date, time, and recurrence e.g. once, daily, weekly, monthly, and yearly. Playing your favorite game or browsing your favorite place? Wondering what time it is? Menu Clock adds a Clock to ALL of your BlackBerry® Smartphone menus. Now you can see the date and time without exiting the application you’re running. myTasks allows you to sort your tasks into projects. The projects themselves can have projects within them. Store voice and text notes in your tasks to organize your progress on the tasks, all within an attractive user interface that you will love the second you lay eyes on it! 8. Super Address Book – FREE by Xobni Corp.
Effortless address book management and search – the most complete address book you’ll ever use. Pocket Informant is designed as the most usable and powerful Calendar, Task, Contacts management software for your BlackBerry. Pocket Informant is the only full featured Personal Information Manager for the BlackBerry that provides an Agenda, Day, Week, and Month Views alongside powerful Task and Contact views. Journal your appointments, tasks, or contacts to store more detailed notes about each encounter or for time billing purposes. Assign category colors and icons so you can more easily see your appointments, tasks and contacts and see what you’re doing this month. The BlackBerry is the pinnacle of mobile productivity and we focus on that with Pocket Informant for the Blackberry! This application allows you to have full control over who you have to call back when; it does not have an icon, you find it in the Menu of your Call Log. From your Call Log or from your Messages application (on some devices, both work, on others only one works) you select an entry, press Menu then ‘Remind me later!’ and now a selection pops up when you want to get notified again about calling back. Follow the screen to enter more information into the calendar entry and click Save. 11. Syncamatic Live – Wireless Sync by PureInbox Inc.
Make your life easier and more productive with the world’s leading BlackBerry® wireless sync solution for everyone! Syncamatic Live lets you manage your BlackBerry® and your data right from your web browser, for FREE! The latest features lets you find your lost BlackBerry and secure your data if it might be stolen. 12. StickyNote (TM) by CellAvant, Inc.
ON SALE FOR A LIMITED TIME! StickyNote allows you to put a customized “StickyNote” right on the home screen of your BlackBerry®, so that every time you glance at your BlackBerry®, you will be reminded of important items. 13. BHive Tasks 3.0 by High Velocity IT Inc.
Filters – View only tasks that contain specific keywords in the task description. This allows you to put GTD contexts (for example @home, @phone) anywhere in your description and then filter on them. 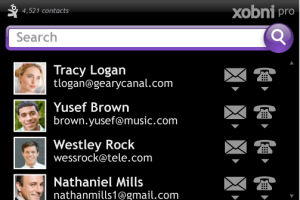 Integrates with BlackBerrys® native task database and thus syncs with Microsoft Outlook, Entourage, ICal etc. Import/Export Tasks – This feature allows you to share tasks between phones via email, backup your tasks, turn emails or text messages into tasks directly from your email application. Mass Create Tasks – Have a long lists of todos in your head that you just want to quickly write down? This is the feature for you! Mass Update Tasks – Do you ever need to reorganize your tasks? Hate doing it one-by-one? This allows you to grab a bunch of tasks and collectively move them into a category, set a common due date, or send them to email. Shortcuts – For the advanced user, BHive offers a broad range of keyboard shortcuts to make you even more productive. Torch Support – BHive has specific features to optimize the experience for touch screen users. Tap the checkbox to quickly complete a task, swipe your finger across the calendar to flip through the months etc. BugMe! is the quick and easy note-taker and reminder for your BlackBerry® smartphone. You can jot notes, ideas and errands as you go and easily set any note as an alarmed reminder. BugMe! will sound an alarm and pop up an alert when its due. Its a very simple GTD® ( “Get Things Done” ) tool for everyone – and a real replacement for your postit® notes! Taking notes with BugMe! is quick, easy and flexible. BugMe!’s note taker recognizes web addresses, email addresses and phone numbers, so its easy to reach out from your notes to websites or make contact with people from the note. BugMe! notes can be used as alarming reminders – which bug you when they’re due. Pick an alarm time from the quick list, or choose a custom alarm and configure repeating alarms to your taste. You can use the BlackBerry® Profiles app to change the sounds, flashing led and vibrate etc. settings BugMe! uses to alert you. 15. Ascendo DataVault Password Manager – BlackBerry and Desktop Bundle by Ascendo Inc. This bundle includes DataVault for Windows desktops. Ascendo DataVault stores confidential information such as Credit Card numbers, usernames, passwords & PINs on your BlackBerry® & Windows Desktop using the most powerful encryption available. — If you know any other great Blackberry apps that helps you keep organized, then please let us know. You guys forgot Office Accelerator Wireless BlackBerry Sync by Baseline Data. You get a product that allows you to network your BlackBerry contacts and Calendar in the Cloud so they can be shared by many users. Just Google Office Accelerator or go to http://www.oawireless.com. Get your Wallet out however, they are pricey at $25.00 per month. They have been around for awhile 21 years so you know yoru data will be safe.